Knitting slumps stink! The yarnbombs are on a deadline–adding a deadline is an instant happy knitting deal breaker. The cassette tape vest is still a beast. After declaring I hate it last week, we needed a bit of a cool down period so it’s been untouched. That didn’t leave much for on-the-go knitting. My weekend involved a bus ride or three, there must be knitting! So I grabbed the only thing handy, my Batad. It had been sitting for two weeks, waiting patiently for a welt seaming row. The persnickety, fiddly row. On the bus. I was determined! Did not matter that I was carrying two bottles of wine and a bouquet of flowers, I was going to welt on the bus. It went surprisingly well! I didn’t lose stitch markers or that third needle I was using, no stitches were dropped, most importantly, no bottles of wine were dropped! and just like that, I was done with the row that kills all progress! My Batad was now ready for the fun short row section! I didn’t get too excited…it was to be short lived! The short row fun is so fun that I always fly through it, and then it gets tossed aside for two weeks until I get around to the welt row. Not this time! I flew through the short rows and kept going! It’s been two days of happy knitting! aaaahhhhhhh! 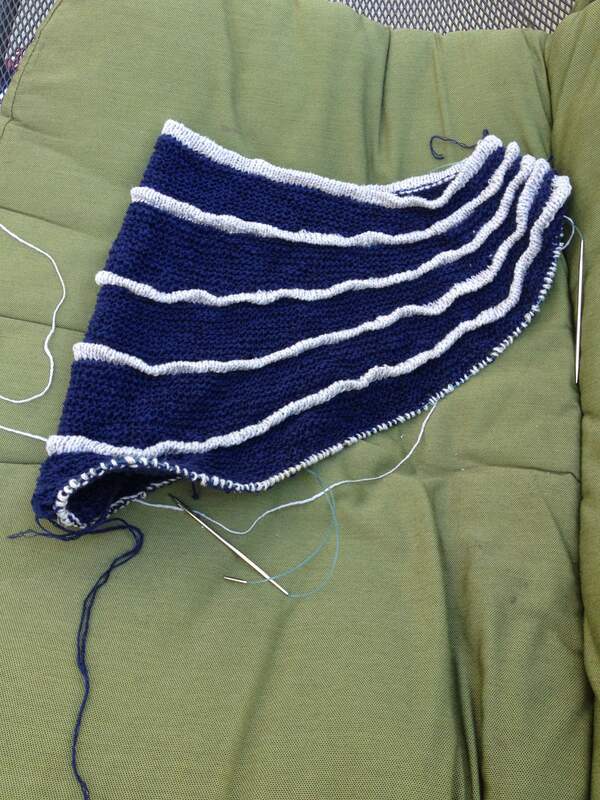 According to the pattern, there’s 9 short row sections, I’m currently halfway through six! There is a tiny little light appearing at the end of the dark, dark knitting tunnel! Very soon I’ll be able to start the next round of projects that I’ll inevitably be cursing a month from now! I can hardly contain the excitement! !